The .243 Winchester is hands-down the most popular caliber for centerfire rifles used by hunters in the US. Near perfect flat trajectory, powerful hit that can bring down almost anything provided you get the range right, and a little recoil makes it just the ideal one for whitetail shooting. But that’s not the only situation that the 243 is used for. 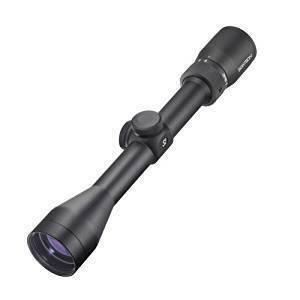 Clubbed with good quality optics, it can very easily be used for long-distance hunting in the bush. From coyote to hogs to pronghorns and the occasional elk, a good quality scope can significantly amplify the performance of your rifle with the 243. Picking a scope is not easy though and depends largely on your use of the rifle. 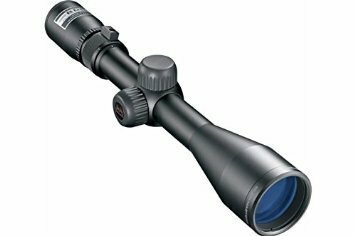 If you intend to use it mainly for varmint shooting, then you’d prefer a scope that can sustain the mild recoil and allow you to see the shot through it. Most scopes for the 243 may end up spoiling your view. After speaking to veteran hunters who have used the 243 for years, here’s our list of the best scope for 243 which can give you the precision you seek for your hunts and also allow you to knock off varmint at 500 yards. Nikon’s Buck Master series of riflescopes were one of the most popular ones used by deer hunters around the world. Nikon just added a few more bells and whistles to it that brings improved precision and performance on the field. It is called the Buck Master II and it offers extreme precision, easy usage, and a very good BDC reticle. The Buck Master II is very similar in design to the original Buck Master. One of the noticeable differences though is that it is lighter than the original. It weighs only 13.6 oz. which is amazing for a lens with 12x magnification. It is constructed of the same metal alloy housing with the matte-black finish that will offer perfect camouflage when shooting from close range. The single-piece construction and the precise sealing offers all-weather capabilities and keeps it fog-free. One of the reasons why Nikon scores over a lot of other scopes at this price point ( check current price )is because of the small additions which make it easier to use in the field. For example, the Buck Master II has a magnification ring that comes with a small non-slip nub that gives you a firm grip and allows you to adjust the magnification in seconds. Similarly, it features resettable spring loaded turrets that let you reset to zero by just lifting them up and rotating the turret top. You can adjust the turrets with your finger and use the protective caps to prevent them from changing. Eliminates the need to use tools and locks. The Buck Master II holds zero even on rifles with a heavy recoil. You can zero in fast with the 1/4-inch MOA and stay locked on even after repeated shots. The multicoated lens with up to 98% light transmission gives you clear, bright and crisp images even in the lowest possible light for shooting. It may lack an illuminated reticle but more than makes up for it with the superior light transmission. On the other hand, if you are taking a shot against the sun on an extremely bright day, the anti-reflective coating on the lens will have you covered. The generous 3.7-inch eye relief will keep your brow safe from the even the most recoil heavy rifles. At the forefront of the features that make this one of the best scopes for the 243, is Nikon’s BDC reticle. This is a very useful feature especially if are shooting long range. The ballistic circles are see through and give you a clear advantage. There is no discrepancy in the quality when shooting crosshair. To further enhance the performance of the Buck Master II, you can use it with Nikon’s Spot-On app that is available for iOS and android. It provides incredibly precise ballistic information that you can use to hit your targets with astute precision. This makes target shooting a cinch. Even if you have your own ballistic calculator, the Buck Master II works perfectly. At a great price, the Nikon Buck Master II will give you the precision and the magnification that you deserve for hunting game. The 3-9x 40 is considered to be the standard for the 243 that gives you the variable magnification you desire for your hunts and also has the added power needed for longer range. One of the best riflescopes in this range is the Bushnell Trophy XLT. It has a proven performance, Bushnell’s reliability and a bunch of features that ease its use in the field. The Trophy XLT Bone Collector edition has a one-piece construction in a very ‘tactical’ matte black anodized finish. 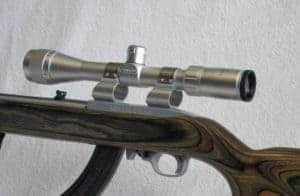 This is almost an indestructible scope that will take a few bumps in its stride and perform flawlessly even on rifles with a fair amount of recoil. Nitrogen purging and 0-ring sealing ensure fog-free visuals. If you are out on a wet or humid day, then the XLT features butler creek flip up caps that will add an additional layer of protection from precipitation. 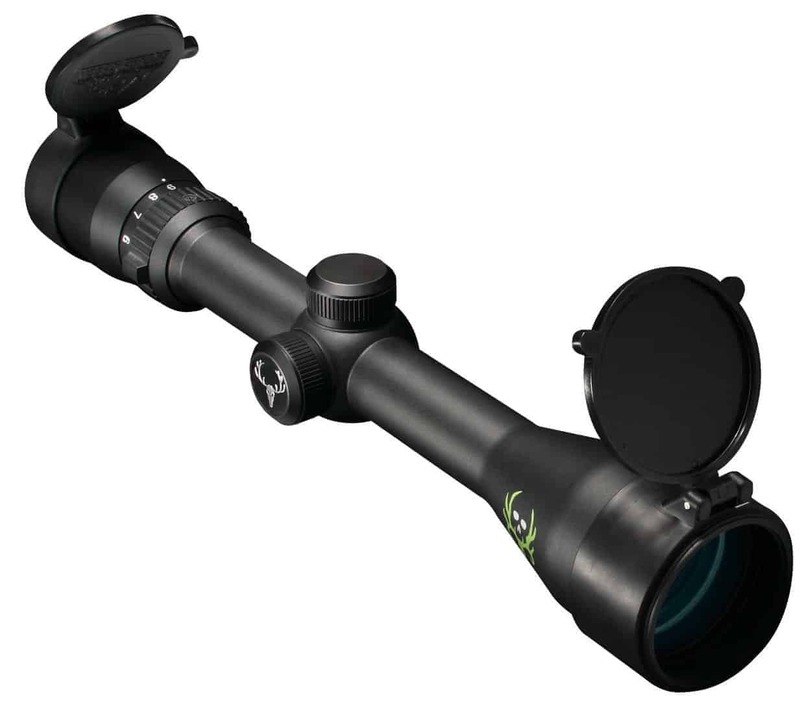 Clearly, this is a scope that is designed for the outdoors and varying weather conditions. One thing about hunting rifle scopes is that you cannot afford to have one that takes forever to adjust. You need a scope that lets you zero down in seconds, focus accurately and hold on to it. The Trophy XLT with its fast focus eyepiece and variable magnification from 3x to 9x will take you remarkably close to the target in no time. To allow pinpoint precision in your adjustments for windage and elevation, there are 1/4 MOA clicks with a tactile feel to it. The multi-x reticle clubbed with the enhanced light transmission gives you the perfect contrast you desire for accurate shooting, eliminating the need for illumination. The crosshair remains perfectly visible even while hunting game in dense undergrowth. You cannot go wrong with the Bushnell Trophy XLT Bone collector edition. You get an all-weather do-it-all scope that is just perfect for varmint, plinking or hunting game. Cannot ask for more. As we said before, it is impossible to go wrong with the 3-9 x 40 for the 243, and our last pick in this list of the best scopes for 243 is the Sightron SIH series. This is a budget-priced offering from Sightron that is made in Japan, which is a respite from the cheap Chinese made scopes that are flooding the market. The SIH series is the do-it-all scope for the 243. It is available in three different reticle choices, and you can pick the one that best suits your shooting style. If you have ever mounted a large scope with a 50 mm objective lens, you’d know right away how ungainly it can look and feel on the gun. The Sightron SIH has a compact form factor that will add only 15 ounces to the gun. 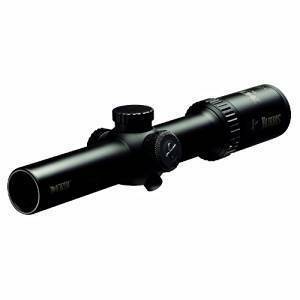 The one-piece body tube is all-metal and very durable for a budget priced scope ( see current price ). We have tested scopes that got dented, or the screws got jammed in extreme weather. Not the Sightron SIH. This is a perfect all-weather scope that is shockproof, fog proof, and Nitrogen filled. Take it out in freezing weather and your shooting glasses may end up getting fogged but the SIH will continue to give you clear visuals. Adjusting everything from windage and elevation to magnification is easy. The knobs and dials are positioned at the fingertips and give you a good grip allowing you to change them easily. The turrets offer easy ¼ MOA adjustments, and the clicks are responsive. This is one of Sightrons entry-level models, and it lacks the Exact-Trac system that tracks to precision. However, it still tracks very well and holds zero without any problems whatsoever. The magnification ring has a knurl which allows you to adjust easily to the range of the magnification. You can zero it at 3x and then when the situation demands, extend it to 9x. The magnification is just perfect for the range of the 243. The Sightron SIH will blow you over with the quality of the optics which is unbeatable considering that this is a budget priced scope. It can very easily give you the same optical quality as a higher end lens from one of the big boys. The multicoated lens gives amazing light transmission giving you precision based images in low light. For a hunt with the 243, this is a crucial requirement, especially if you are treading the woods at twilight. At the same time, it also offers excellent performance in bright light or glare. For example, if you are shooting in the snow with the sun directly behind the target, you can zero down and hold on in seconds with the Sightron SIH. Another very good feature of the Sightron SIH is the variable eye relief that it offers. Sightron claims that the eye relief varies from 3.0 – 3.9 which is phenomenal by any standards. But when put to the test, it offers a whopping 4.5 inches at 3x zoom. That will keep your brow safe on even the most shoulder-bruising recoil. This makes this a great scope for beginner hunters. If you have kids with the 243 or ladies, then the Sightron SIH should be the first choice due to this feature alone. No more scope-eye. Sightron backs up the SIH with their warranty which is available on some of their higher priced SIII models. You can get a free replacement for any manufacturing defects even if you bought the scope from someone else and are not the original owner. For the money, the Sightron SIH brings tremendous value to the table. In fact, it would be fair to say that it stands on-par with the Nikon which is our #1 rated best scope for the 243. Your choice of a scope for the 243 depends on what conditions you will be shooting in and the amount of money you are willing to spend for it. If the conditions are mostly bright and in open grasslands or shrubs, like in Africa, then you rarely need a very high-end optical scope. Any one of these scopes will allow you to zero down on your target in seconds. But even otherwise, in less than favorable light, for example in a pine tree forest on an overcast day, you can mount any of these scopes and come back home with the biggest buck that the 243 can bring down. gunsite.co.za : What scope for .243 rifle? onyourownadventures.com : Best Scope for $200 to $250 for a .243 ?? ?